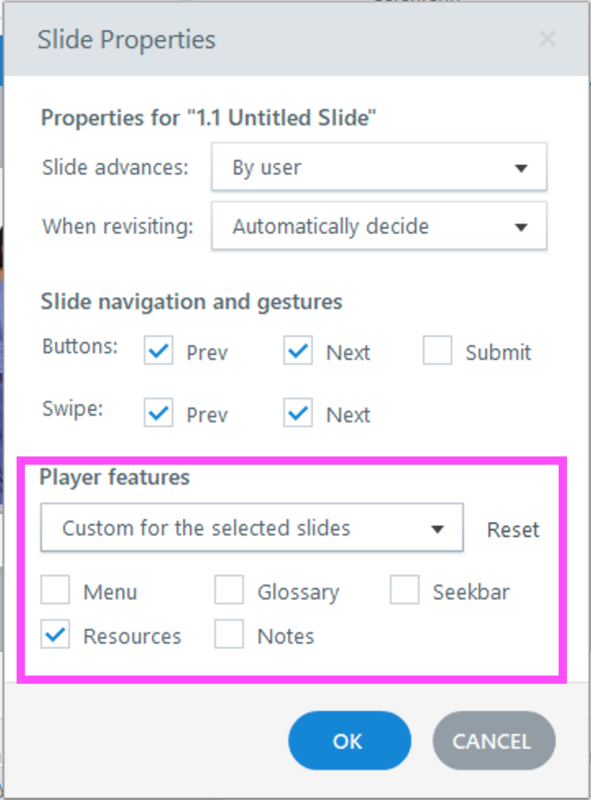 I have an "Exit" button available in the player throughout my Articulate 360 lesson yet need to remove this "exit" button for the last several slides to keep people from jumping out of the lesson too early. One note: We are recording the results by a quiz results slide, then have several slides after the results for the learner to download some elements. So setting it up to report by number of pages viewed is not accurate for recording results. Any suggestion on making and selecting a "custom player" for just these slides? Or a trigger to remove the "exit" button in the player? Or remove the "exit" button on all slides but add a trigger to have it available on the rest of the slides in the lesson (ex. if there are 50 slides, 48 would have an additional triggering to add the "exit" button in the menu). Would it be possible to make that player tab a button that goes on a slide master layout? Then you can use a similar layout that doesn't include the button for those slides where you'd like to avoid it. Thank you for responding to my post. Your idea currently is the only option working for me yet I tried another idea after talking with some of my team. I also tried using the "modern" vs. "classic" player style to see if that made a difference... nope. I also tried the variable on the "exit" button within the player to start as "false" and then make it "true" on all the other slides...didn't work ...just stayed disabled on all slides. I think this triggering is going in the right direction because it does disable the "exit" button yet I must be forgetting one more trigger to make it work. The Exit Course trigger does not work in all browsers. Be sure that it works as expected in a regular environment for you and that you're using one of these browsers. If so and you need us to take a look, feel free to share your .story file. Can you share your .story file to see if there is another trigger or setting interfering with this? Are you able to share it here? That way we may be able to offer some other alternatives or ideas if this setup won't work as you need!